Rajagiri SignsMoU with HochschuleRavensburg - Weingarten University of Applied Sciences, Germany. Prof. Dr. Michael Pfeffer, Vice-Rector, HochschuleRavensburg Weingarten University, Germany visited Rajagiri College of Social Sciences (Autonomous) andRajagiri School of Engineering and Technology and signed a Memorandum of Understanding between HochschuleRavensburg Weingarten University of Applied Sciences, Germany with both the institutions in order to cooperate in a broad range of educational activities for the mutual benefit of their students, faculty, staff, institutions, states, and countries. 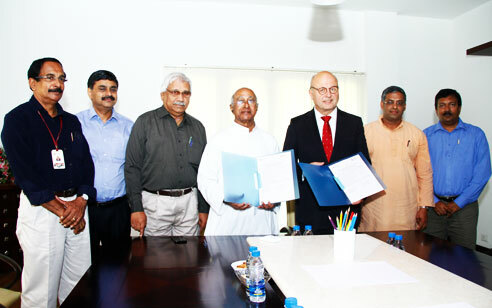 As per the agreement, Rajagiri and HochschuleRavensburg Weingarten University of Applied Science, Germany, enable students from each institution to study at the partnering campus. This will help the students to understand the cultural differences and similarities of two different countries. Exchange of faculty, for the purposes of lecturing, conducting research, and developing their academic skills is also envisaged under the agreement. The partnership agreement also include Research Collaboration, this will help the joint research activities of both institutions. Fr. Jose Alex CMI, Director of Rajagiri Group of Institutions, Dr. Joseph I Injodey, Executive Director, Dr. Binoy Joseph, Principal of Rajagiri College of Social Sciences (Autonomous), Dr. A. Unnikrishnan, Principal, Dr. John M George, Vice Principal and Fr.Dr. Varghese Panthalookaran of Rajagiri School of Engineering and Technologywere present on the occasion.